The Meiji Restoration (明治維新, Meiji Ishin), also known as the Meiji Ishin, Renovation, Revolution, Reform, or Renewal, was a chain of events that restored practical imperial rule to Japan in 1868 under Emperor Meiji. Although there were Emperors before the Meiji Restoration, the events restored practical abilities and consolidated the political system under the Emperor of Japan. The foundation of the Meiji restoration was the 1866 Satsuma-Chōshū Alliance between Saigō Takamori and Kido Takayoshi, leaders of the reformist elements in the Satsuma Domain and Chōshū Domain. These two leaders supported the Emperor Kōmei (Emperor Meiji's father) and were brought together by Sakamoto Ryōma for the purpose of challenging the ruling Tokugawa shogunate (bakufu) and restoring the Emperor to power. After Emperor Kōmei's death on January 30, 1867, Emperor Meiji ascended the throne on February 3. This period also saw Japan change from being a feudal society to having a market economy and left the Japanese with a lingering Western influence. The Tokugawa Shogunate came to its official end on November 9, 1867, when Tokugawa Yoshinobu, the 15th Tokugawa Shogun, "put his prerogatives at the Emperor's disposal" and resigned 10 days later. This was effectively the "restoration" (Taisei Hōkan) of imperial rule – although Yoshinobu still had significant influence and it was not until January 3, the following year, with the young emperor's edict that the restoration fully occurred. 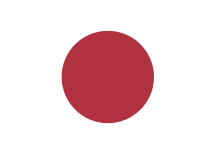 The Emperor of Japan announces to the sovereigns of all foreign countries and to their subjects that permission has been granted to the Shogun Tokugawa Yoshinobu to return the governing power in accordance with his own request. We shall henceforward exercise supreme authority in all the internal and external affairs of the country. Consequently the title of Emperor must be substituted for that of Taikun, in which the treaties have been made. Officers are being appointed by us to the conduct of foreign affairs. It is desirable that the representatives of the treaty powers recognize this announcement. Some shogunate forces escaped to Hokkaidō, where they attempted to set up a breakaway Republic of Ezo; however, forces loyal to the Emperor ended this attempt in May 1869 with the Battle of Hakodate in Hokkaidō. The defeat of the armies of the former shogun (led by Enomoto Takeaki and Hijikata Toshizō) marked the final end of the Tokugawa Shogunate, with the Emperor's power fully restored. A teenage Emperor Meiji with foreign representatives at the end of the Boshin War, 1868-1870. There were many causes of the Meiji Restoration. The Japanese knew that they were behind the European world when American Commodore Matthew C. Perry came to Japan to try to issue a treaty that would open up Japanese ports to trade. Perry came to Japan in large warships with armament and technology that far outclassed those of Japan. The leaders of the Meiji Restoration, as this revolution came to be known, acted in the name of restoring imperial rule to strengthen Japan against the threat represented by the colonial powers of the day, bringing to an end the era known as Sakoku (the foreign relations policy, lasting about 250 years, prescribing the death penalty for foreigners entering or Japanese nationals leaving the country). The word "Meiji" means "enlightened rule" and the goal was to combine "modern advances" with traditional "eastern" values. The events occurring in neighboring China during the European influenced Opium Wars may also have motivated the Japanese leadership to rethink isolationist policies. The main leaders of this were Itō Hirobumi, Matsukata Masayoshi, Kido Takayoshi, Itagaki Taisuke, Yamagata Aritomo, Mori Arinori, Ōkubo Toshimichi, and Yamaguchi Naoyoshi. Under the leadership of Mori Arinori, a group of prominent Japanese intellectuals went on to form the Meiji Six Society in 1873 to continue to "promote civilization and enlightenment" through modern ethics and ideas. 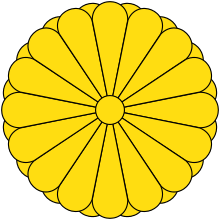 However, during the restoration, political power simply moved from the Tokugawa Shogunate to an oligarchy consisting of these leaders, mostly from the Satsuma Province (Ōkubo Toshimichi and Saigō Takamori), and Chōshū Province (Itō Hirobumi, Yamagata Aritomo, and Kido Takayoshi). This reflected their belief in the more traditional practice of imperial rule, whereby the Emperor of Japan serves solely as the spiritual authority of the nation and his ministers govern the nation in his name. The Meiji Restoration accelerated industrialization in Japan, which led to its rise as a military power by the year 1905, under the slogan of "Enrich the country, strengthen the military" (富国強兵, fukoku kyōhei). In 1868, all Tokugawa lands were seized and placed under "imperial control", thus placing them under the prerogative of the new Meiji government. With Fuhanken sanchisei, the areas were split into three types: urban prefectures (府, fu), rural prefectures (県, ken) and the already existing domains. 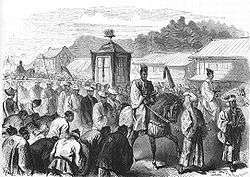 In 1869, the daimyo of the Tosa, Hizen, Satsuma and Chōshū Domains, who were pushing most fiercely against the shogunate, were persuaded to "return their domains to the Emperor". Other daimyo were subsequently persuaded to do so, thus creating, arguably for the first time, a central government in Japan which exercised direct power through the entire "realm" (天下). 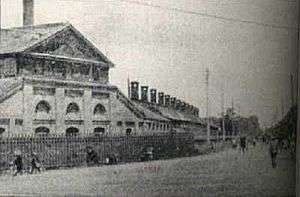 The Tokyo Koishikawa Arsenal was established in 1871. To reform the military, the government instituted nationwide conscription in 1873, mandating that every male would serve for four years in the armed forces upon turning 21, followed by three more years in the reserves. One of the primary differences between the samurai and peasant classes was the right to bear arms; this ancient privilege was suddenly extended to every male in the nation. Furthermore, samurai were no longer allowed to walk about town bearing a sword or weapon to show their status. This led to a series of riots from disgruntled samurai. One of the major riots was the one led by Saigō Takamori, the Satsuma Rebellion, which eventually turned into a civil war. This rebellion was, however, put down swiftly by the newly formed Imperial Japanese Army, trained in Western tactics and weapons, even though the core of the new army was the Tokyo police force, which was largely composed of former samurai. This sent a strong message to the dissenting samurai that their time was indeed over. There were fewer subsequent samurai uprisings and the distinction became all but a name as the samurai joined the new society. The ideal of samurai military spirit lived on in romanticized form and was often used as propaganda during the early 20th century wars of the Empire of Japan. The military of Japan, being strengthened by nationwide conscription and the infusion of a samurai military spirit, became emboldened to see themselves as a growing world power after winning both the Sino-Japanese War and the Russo-Japanese War. Besides drastic changes to the social structure of Japan, in an attempt to create a strong centralized state defining its national identity, the government established a dominant national dialect, called "standard language" (標準語, hyōjungo), that replaced local and regional dialects and was based on the patterns of Tokyo's samurai classes. This dialect eventually became the norm in the realms of education, media, government and business. The Meiji Restoration, and the resultant modernization of Japan, also influenced Japanese self-identity with respect to its Asian neighbours, as Japan became the first Asian state to modernize based on the European model, replacing the traditional Confucian hierarchical order that had persisted previously under a dominant China with one based on modernity. ↑ Bestor, Theodore C. "Japan." Countries and Their Cultures. Eds. Melvin Ember and Carol Ember. Vol. 2. New York: Macmillan Reference USA, 2001. 1140–1158. 4 vols. Gale Virtual Reference Library. Gale. Pepperdine University SCELC. 23 November 2009 . ↑ Shih, Chih-yu (Spring 2011). "A Rising Unknown: Rediscovering China in Japan's East Asia". China Review. Chinese University Press. 11 (1): 2. JSTOR 23462195. (registration required (help)). ↑ Yamamura, Kozo. "Success Illgotten? The Role of Meiji Militarism in Japan's Technological Progress." The Journal of Economic History 37.1 (1977). Web. Akamatsu, Paul (1972). Meiji 1868: Revolution and Counter-Revolution in Japan. New York: Harper & Row. p. 1247. Beasley, William G., . (1972). The Meiji Restoration. Stanford: Stanford University Press. Beasley, William G. (1995). The Rise of Modern Japan: Political, Economic and Social Change Since 1850. New York: St. Martin's Press.